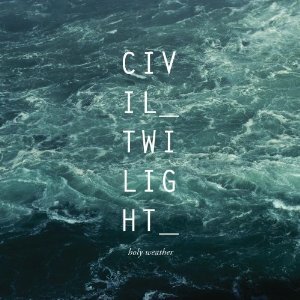 Civil Twilight‘s latest release Holy Weather is a unique work to behold. Each of the tracks on the album are unique in their own special way. For example: “Every Walk That I’ve Ever Taken Has Been In Your Direction” is a surreal emotional trip with rampant melodies. The whole track feels grand and sweet. “Fire Escape” is a bit more dance-y, sounding a little bit like Locksley, and it just feels bound for a car commercial. Don’t let that detract you — that’s just to say that the track keeps moving on with excitement. “River” is a bit more of a calming indie rock track. You can dance around to the various “woo’s” at the start. Even better is “Doorway,” which is perhaps the quietest on the album and clearly a take at an “acoustic” track. The attention to vocals just makes it sweet and focused on the words coming out of McKeller’s mouth. The band will surely make you think of U2 when you pick the album up, but in this case, that’s a good thing.